All “Freedom to Operate” and Invalidity Searches will be performed by experienced patent lawyer and are based on FLAT FEES. Infringement and invalidity opinion works are hourly rated. A “freedom to operate” (FTO) assessment allows a business to identify and manage the risk that its product may infringe patent rights of others. The FTO assessment is based on a search for patents that may claim the key features of the product in question, and a comprehensive analysis for determining whether the product would infringe the patents found. 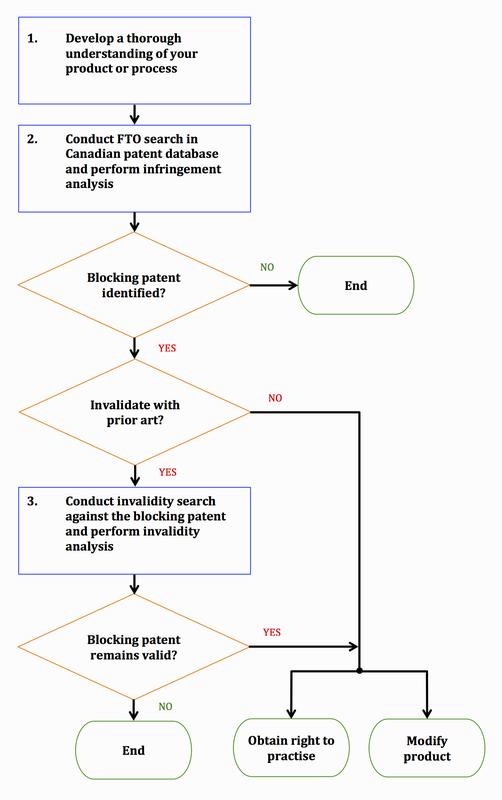 In Canada, the patent claim at issue must be interpreted or construed before conducting infringement analysis. Claim construction must respect the purpose of the patent according to the entire patent specification so as to give meaning to the terms used in the claim and identify the essential elements of the claim. After the claim construction, the allegedly infringing product is to be compared with the construed patent claim. To find infringement, the product must include all essential elements of the patent claim. If the FTO assessment identifies a patent claim that can potentially “block” you from commercializing your product, you may mitigate the risk. For example, you may search for prior art that can be used to invalidate the blocking patent claim. Alternatively, you may obtain a licence to practise the blocking patent from its owner, or modify your product to avoid infringement.